iBall now presents an upgraded version of its Aasaan series of phone with many new features as per feedback from the present users – iBall Aasaan4. It focuses on the holistic needs of seniors with bigger screen than the counterparts. It also comes with unique features of ‘Braille & Talking keypad’ for the visually impaired as well as mobile tracker which alerts one of the predefined family members once the new SIM card is inserted. With easy-to-read larger screen of 5.86 cm (2.31”), large display fonts and large dialing keys, iBall Aasaan 4 Senior Mobile Phone ends the struggle of making a call and makes it comfortable. In a bid to empower differently-abled, the phone is equipped with the Braille keypad, for the visually impaired. Users, who are not conversant with Braille, can activate the talking keypad feature that speaks out the digit pressed in English. Keeping security, at utmost importance with senior citizens, Aasaan4 comes with the SOS feature which will help the users to get help during emergencies. Pressing the SOS button sets off a siren to alert the folks nearby; it also starts sending SMS to 5 predefined numbers and starts calling 5 predefined loves ones till one of them picks the call. Keeping in mind on communication needs during emergencies, the phone is equipped with the activated speed dial. At the touch of a button, it gets automatically directed to the first emergency contact. With the unique built-in app ‘Aasaan’ the phone also backs senior citizens’ needs. It comes with Medicine Reminder that keeps their road to recovery on track, while the Hearing Aid feature allows conversations with better clarity. 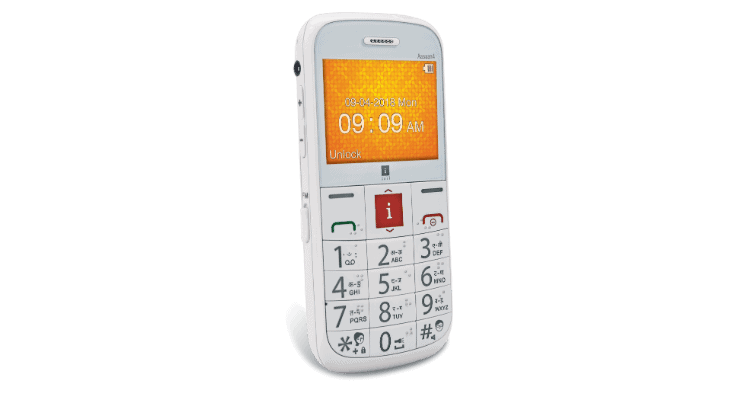 The feature phone also acts as the Magnifier to zoom in and read out contents with clarity, while the Human Voice incoming call enables to know the caller without straining an eye. Users can also save favourite speed dial numbers on the ‘*’ and ‘#’ keys, thus avoiding the hassle of remembering the speed dial numbers assigned. The Dual SIM phone, with increased 1800 mAh battery and Micro SD support of up to 32 GB, can store up to 200 text messages and 1000 contacts on the phonebook without any hitch. The phone is also armed with ‘Chambered Speaker’ and built-in FM Radio, to keep elderly ones entertained. The no-frills design, thoughtfully supports 10 Indian Regional System languages and also multi-Indian Regional languages with Read and Write support for SMS. Crafted in the shade of ‘Serene White’, with a simple user interface and one touch buttons for Phone Lock, LED Torch and Wireless FM, the phone is all set to provide for a faster and convenient user experience. iBall launches its Upgraded Senior Citizen Phone ‘Aasaan 4’ 0 out of 5 based on 0 ratings. 0 user reviews.